The long-running E-Class slots between the entry-level C-Class sedan and the flagship S-Class sedan in the US model range. There are several models with alphanumeric model names to indicate the powertrains within. A 302-bhp 3.5 L V6 powers the E350, whereas a 402-bhp V8 powers the E550. Both are fitted with a 7-speed automatic transmission. Customers can choose to add 4MATIC all-wheel-drive for all-weather traction. A sport appearance package adds body cladding and more aggressive wheels and tires. The ultimate E-Class sedan is the E65 AMG, a factory tuned beast with over 500 horsepower under the hood. Mercedes adds a gas/electric hybrid model for 2013. 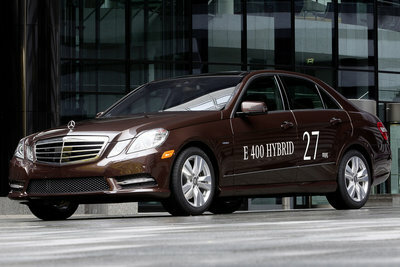 The E400 Hybrid pairs a V6 engine with an electric motor for additional power and fuel economy. An updated telematics system becomes standard equipment.